Honey, I Shrunk the Wedding Ring! The Case of the Shrinking Wedding Ring! This is supposed to made of a precious metal, but why is my wedding ring shrinking? Is this the magic of marriage? When I moved in with my husband after our wedding more than 10 years ago, so many things have happened. Aside from our two kids, perhaps the most obvious would be my weight gain. After two pregnancies and the continuous cycle of life, I find it hard to lose weight, even while doing the things that I used to before in order to shed some pounds here and there. All in all, I have gained about 30 lbs since I married my husband. Thankfully, the husband doesn’t complain about my appearance. But I do. I keep on complaining because I feel heavy and it’s much harder to move around with the extra weight I am carrying. But I love to eat and food loves me, too, because it stays with me as stored fat. I usually wear these two rings together, my engagement ring and wedding ring. Despite the 30-lb unsightly weight gain, perhaps many would notice that I still keep wearing my wedding ring. Nope, I didn’t have my wedding ring resized to fit. It also doesn’t mean that my fingers didn’t get fat because in fact, my fingers are really stout now. So why do I still have my wedding ring on? That is because that is not my own ring. That is my husband’s ring, which has my name written on it. My ring can fit his “slender” finger and so I “borrowed” his ring. And I have been wearing his ever since. That would be several months now. 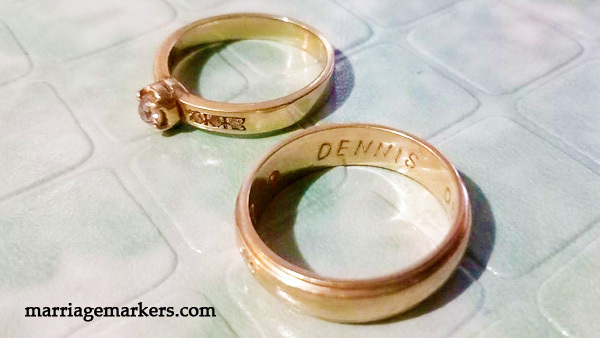 My husband and I both have yellow gold wedding bands, each with three small diamonds. We had them custom-made by a local jeweller–a gift from my father-in-law. And I can easily have it resized if I want to for a little fee. But you and I know that is not the answer to my situation. Now, the big question is: DO I WORK OUT TO GET MY RING BACK? Do I resolve to lose weight in order to be healthier, to fit in my smaller clothes, and also to fit in my wedding band? Of course I know the answer. The problem is, I still don’t have the determination to do it. I really have no intentions of getting back to my 100-lb frame. But losing 15 lbs and keeping it that way would be really nice. I think that would already be a healthy weight for me.